Much time and effort is made by a variety of people in myriad professions to define something that as 'authentic.' On several occasions, most notably with Coca-Cola in the 1970s, the term "The Real Thing" has been coined to define an experience that is one unto itself. After witnessing his sold-out performance in front of 74,177 at the Houston Livestock Show and Rodeo on March 10, this can be officially said: Cody Johnson is the real thing. Of course, those who are Johnson's fans already know this. Last year alone, Johnson played for close to a half-million fans with sell outs across the United States. It's been an amazing ride so far for Johnson, a native of tiny Sebastopol, Texas. A former prison guard, Johnson started playing music when he was twelve years old – forming his own professional band when still a teenager. He self-released three albums from 2006 through 2009, and then teamed up with Trent Willmon to work on A Different Day, which led him to being named as New Male Vocalist of the Year by the Texas Regional Music Awards. The exposure Johnson gained helped to spread the word about his talent. The next Willmon-produced album, Cowboy Like Me, hit No. 7 on the Country Album charts in the winter of 2014 – without the benefit of a charted single. He did tally a pair of entries into the Country Airplay chart in 2016-17 (with his "With You I Am" peaking at No. 40), which led to his most impressive showing yet – 2016's Gotta Be Me hit No. 2 on the Country Albums chart, also registering at No. 11 on the Billboard 200. All of these represent some amazing statistics, considering how many people still fall into the "who is Cody Johnson?" category. But until you've witnessed the power of an artist on stage with a stadium filled to the rafters with fans singing along to lyric after lyric, you don't quite get it. Last year, Johnson got a phone call from the Houston Rodeo brass. Old Dominion was going to have to cancel their performance. Could Johnson fill in for the band on the night of their scheduled performance? He performed that task – just fine, selling over 63,000 tickets. When organizers were looking at putting together the lineup for 2018, the question was asked again – Could Johnson step up to the plate as the only independent artist on the lineup? Consider it another career peak in the rise of an artist that continues to deliver. "It's overwhelming. It brings tears to my eyes just thinking about it. Because this is my life. I never thought about being a star. I just wanted to play music because I just had things to say. I had things I wanted to sing about," said Johnson to Billboard before his show. The topics of his songs – heartfelt moments such as the autobiographical "Every Scar Has Its Story" – touch upon a wide variety of emotions, with one common theme resonating. "I sing about real things, like heartbreak and joy and hope or despair - real emotions that we all face," he says, adding that he gains the bulk of his inspiration from his wife Brandi. "I have a really faithful, great, wonderful relationship with my wife, but I like singing about heartbreak because it's real," he says. "I can only imagine what it would be like if she left, so I need to be able sing a song about that, because somebody out there is going to relate to that – just like the good things." Though Johnson has successfully carved out a market in his native Lone Star State, one would be wise to not label him as "Texas Artist." The music of Cody Johnson is a little too wide and far-reaching to be limited. He is selling out venues from North Carolina to Tennessee, and scored a career triumph with an Aug. 2017 performance at The Troubadour in Los Angeles. For those who haven't heard a Johnson song on the radio yet -- but have heard his name being touted as 'One To Watch' -- what would he want them to know? "I'd like them to wonder 'Why haven't I heard about this?' We've never had a record deal," he surmised, "though we've been offered some really good ones. It just never worked out. I've never had any backers. It's all been me and my team from the very beginning where there was nothing, just grinding it out and grinding it out and never giving up and never taking no for an answer and trying even when the doors were closed." Confidence is something that Johnson has in great measure, but he's able to back it up. All he wants is that chance for the audience to connect. "I hope that somebody would walk away and say, 'Man, that guy that I had never heard of, really poured his heart and soul into that.' I'm not faking it up there. When you see me great emotional, it's real." Having just wrapped up recording for his next project, he is looking to the future – with, you guessed it, confidence. "We're going to have a new record out this year that will capture what I do live in the studio. It's the first record I've ever recorded that I like to listen to." Part of that ownership stems from the fact that he says he made his feelings more prevalent in the studio – something that Willmon pushed him to do, for better or worse. "I'm going to give you my opinion. If I'm wrong, tell me I'm wrong. But I'm not going to hold anything back, I'm going to tell you exactly whether it's good or bad or whatever. But, several times, I spoke up and said, 'This is the way I feel like it ought to be,' and then, two or three takes later I went, 'Man, I'm wrong. Let's back up. We'll back up and try your approach now.'" And his approach – with back-to-back top-ten country albums – is working pretty good these days. What is that next level? "I'll admit I think about it some," Johnson said with a twinkle in his eye when pondering his next move. "Honestly, I try to just do what I've always done and just pray about it and let it go and whatever's supposed to happen is supposed to happen," he says, adding that he hopes that he can partner with a label to take his music to a larger crowd – but his track record allows him to be a little selective in choosing. "I want to maintain masters and creative control and if I'm not broke, don't fix it. Give me a chance to screw up before you start telling me we ought to do this, we ought to do that." 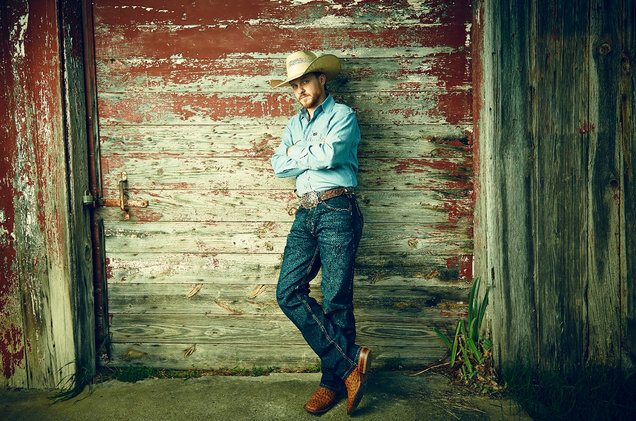 If you go by appearances, the appeal of Cody Johnson might be viewed as a simply regional thing, especially in today's research-driven, genre-bending world of country music. But there's something in his approach that evokes a comparison to George Strait and Garth Brooks – two artists who have sold out nights at the Houston Livestock Show – and beyond. They were an authentic brand: the real deal.